Coke Dry Quenching (CDQ) is a heat recovery system to quench red hot coke from a coke oven to a temperature appropriate for transportation. It is an energy saving system in which, during quenching process, sensible heat of the red hot coke is recovered and utilized for power generation or as steam. Feature of CDQ process are follows. CDQ (Coke Dry Quenching) is a gradual coke quenching system, and improves coke strength and coke size distribution. Consequently, while the blending ratio of inexpensive non- or slightly-caking coal for coke oven material is only approx. 15% in case of CWQ (Coke Wet Quenching) system, it can be increased up to approx. 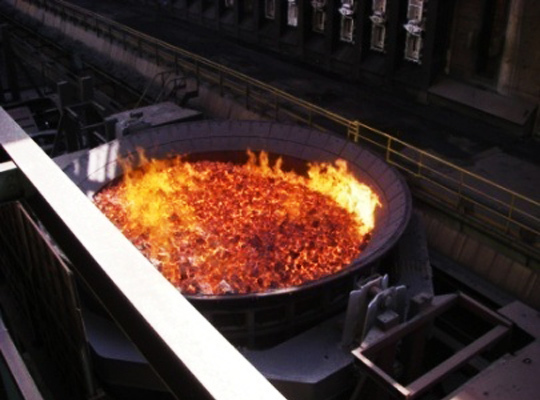 30% by CDQ, resulting in a cost reduction with raw materials for coke oven. The CDQ coke has lower moisture content (0.1 to 0.3%) than CWQ coke (2 to 5 %), and the Coke ratio of Blast furnace can be reduced. 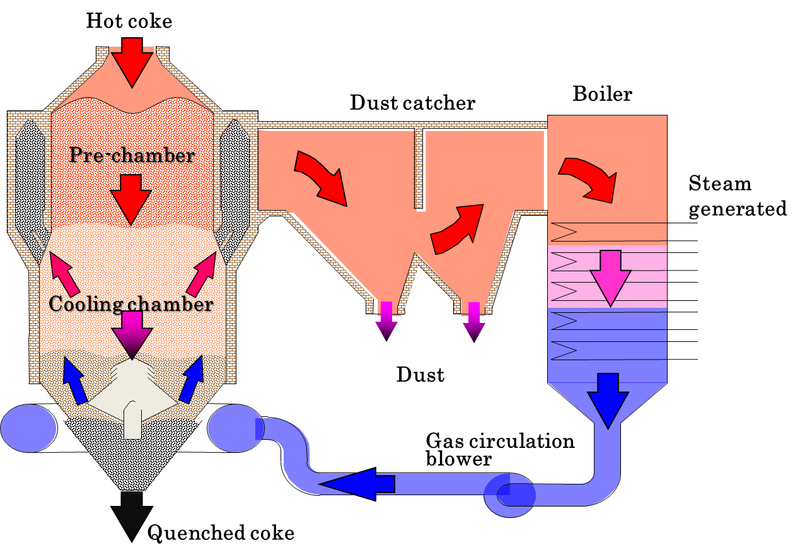 Combustible component and coke dust in circulating gas are burned by blowing air into the gas, and so the temperature of the circulating gas can be raised. Thus, steam generated by the waste heat boiler can be increased. A high annual operating ratio of 95% can be achieved by combining the Double Flue technology, appropriate refractories and highly reliable equipments. Steam generation of 500-700 kg/t-coke and power generation of 140-185 kWh/t-coke can be obtained, according to CDQ operation and steam conditions. Such excellent features realize the payback period of initial investment within three to five years. 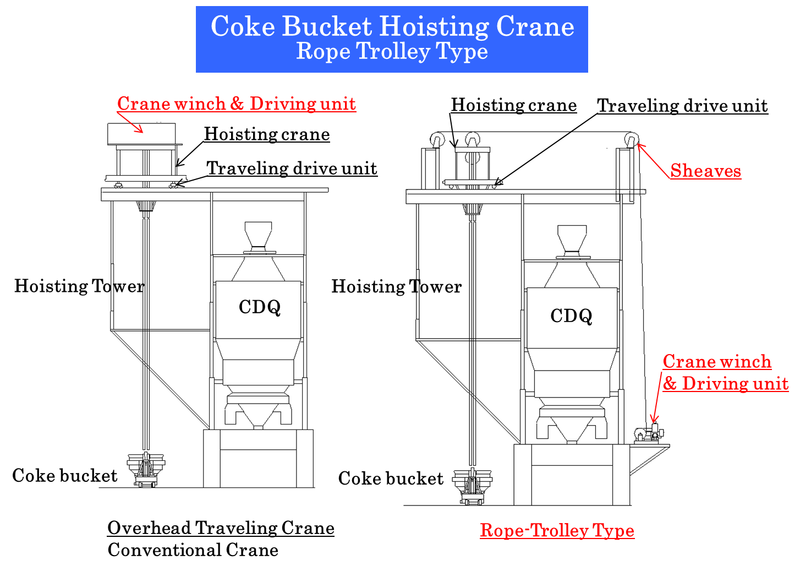 Steel Plantech has developed “New coke handling system (*1)” and “Rotary bucket new traverser system (*1)”. Such technologies enable the layout flexibility of CDQ. Our large CDQ can be introduced even in a narrow space where it is difficult to install the conventional CDQ system. Our design meets customer’s requirement. Want to extend the life of equipment such as waste heat boilers and gas circulation system. CDQ is one of the excellent countermeasure to global warming. Recovered heat by CDQ is used to generate steam or electric power, which leads to a reduction of fossil fuel usage at power plant. Thus, you can reduce CO2 emissions in total. 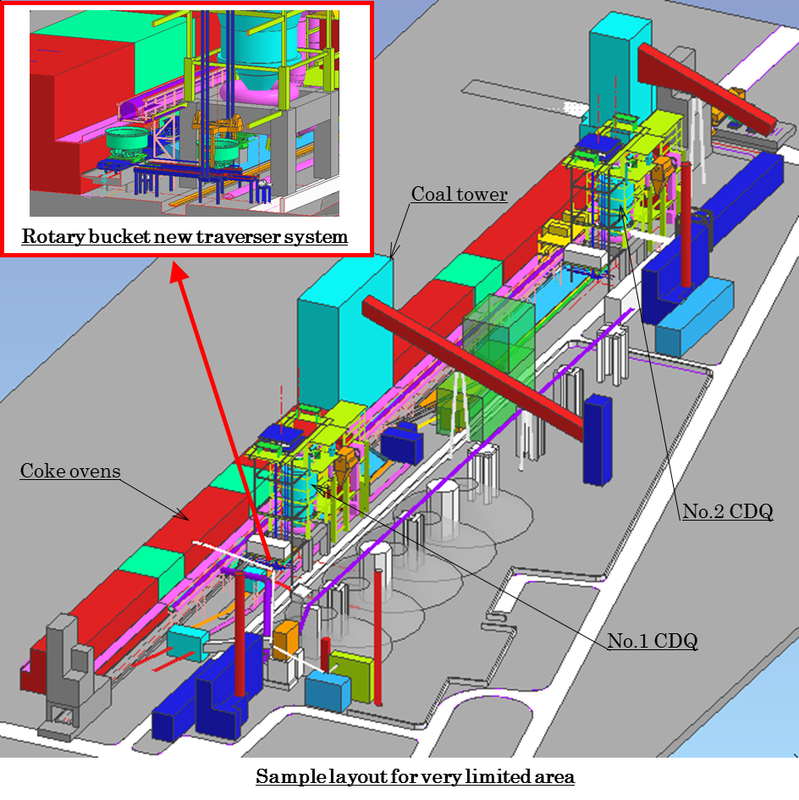 In CDQ, red hot coke is quenched in a closed cooling gas circulation, CDQ remarkably reduces the dust to be released into the atmosphere as compared with the CWQ. 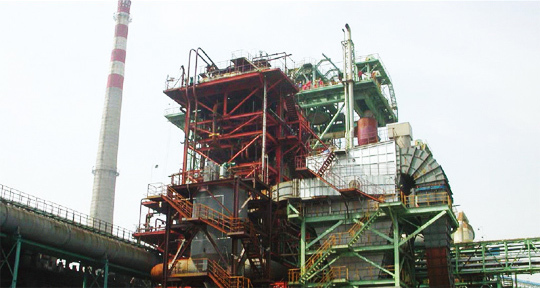 CDQ is a gradual coke quenching system and can improve the coke strength, as the raw material for blast furnace. And coke size distribution can be improved in the process of descending coke packed bed. These characteristics are useful for stable operation of a blast furnace, in order to secure good gas and solid reaction by keeping permeability in a blast furnace. 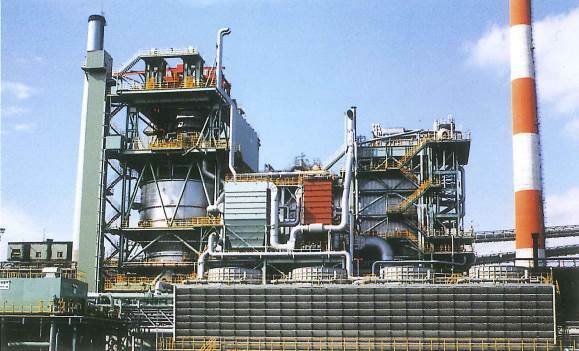 A Solution for Coke Carrying-over Phenomenon and Increase in Circulation Gas Flow by Introducing "Double Flue"
In order to resolve the issue of coke blowing up and carrying-over phenomenon, Steel Plantech developed the “Double Flue” which has two-decker flue paths. 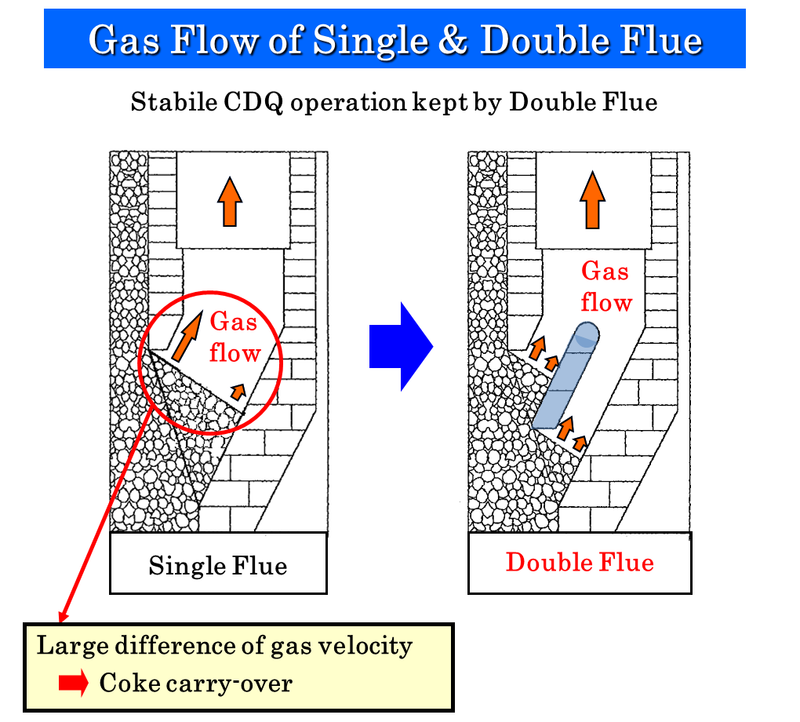 By adopting Double Flue, a two-decker flue, the flow speed of the gas, which causes coke carrying over phenomenon, can be increased by 1.4 times or more of that of Single Flue. As a result, circulating gas would be increased to 1,400Nm3/t-coke or more even in case of a large-scale CDQ without any trouble. On the other hand, if the flow rate is the same as that of single flue, it is possible to decrease abrasion of waste heat boiler, secondary dust collector and gas circulation blower. This results in remarkable extension of the life of whole facility. Furthermore, the Double Flue can reduce the load on dust treatment equipment. By application of Double Flue to the CDQ, remarkable efficiency can be achieved like stable operation, reducing maintenance cost and operation cost. Conventional overhead crane winch and electric equipment are used on CDQ top, in a corrosive atmosphere, before. As our Rope-trolly type installs the crane winch on near the ground level, operation and maintenance environment is much improved, and this leads to life extension of the crane winch.